We are featuring Francesca Pardi, Community Manager of Bull Moose Club. She brings 10 years of meeting and event planning experience to her role. Keep reading to learn more about Albany&apos;s newest coworking community and her favorite space in the facility. Our space includes open workspace, private offices and suites, and meeting rooms. 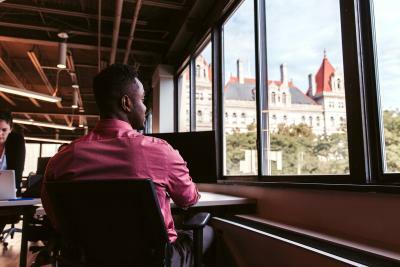 Our open space is fantastic and includes sweeping views of the NYS Capitol, Albany City Hall and State Street. I love watching people meet for the first time, and we are already starting to see collaboration and friendships form. The view from the open space is even better at night when the State Capitol is lit up, making it a great event space too! What does coworking mean to you? Our work is centered around building a new community of changemakers. We provide hyper-charged workspace that has a lot of flexibility and all these amenities, but the important thing are the connections that will get built here. The programs we host and conversations we start. This is way beyond a real estate development and cool desks and chairs to use. The space is built for creative collisions, and these connections will ultimately result in new private sector growth in the city and state. We have seen this happen already at our Troy Innovation Garage location. What do you think is the best way for event managers to be creative in a coworking space, like the Bull Moose Club? Find ways to work with people who are members of the community and people who are invested here. Our members all are doing something interesting, something positive, or something NEW. I work on encouraging members to host events outside the traditional meetings, bring in discussions that may be current in today’s economy whether they be trendy topics or tough topics. Why did the Bull Moose Club choose their location in Albany? 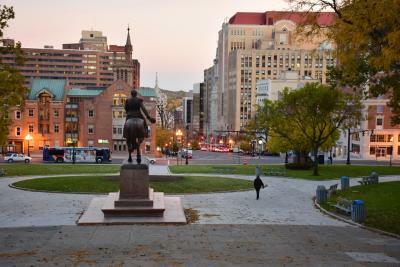 Downtown Albany has positive momentum right now and is prime for this. We need more flexible workspace in the region and we saw an opportunity after the successes we had at Troy Innovation Garage. In part, Bull Moose Club directly dials into the very stable political and government economy that already exists. We create some new opportunities in that space. But, we are also infusing the knowledge and experience we have working with startups and remote workers who want a work environment like this. It’s a recipe for collaboration and creativity. And, the location mattered a great deal. We are so close to the Capitol and in Downtown, where people want to work and have to do business. It made sense.